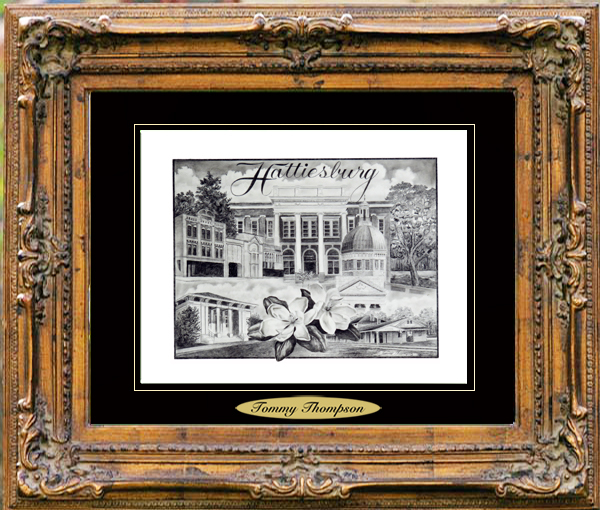 Hattiesburg, Mississippi, was founded by William H. Hardy, a pioneer lumberman and civil engineer, who named the town in honor of his wife, Hattie. The town expanded as a center of the lumber and railroad industries, from which it derived its nickname of “The Hub City.” It now attracts newcomers to the area because of its diverse economy, strong neighborhoods, and central location in south Mississippi. The town is the home to the University of Southern Mississippi and William Carey University. South of Hattiesburg is Camp Shelby, the largest National Guard training base east of the Mississippi River. Notable residents of Hattiesburg have included Jimmy Buffett, musician; Brett Favre, former National Football League quarterback; and Eddie Hodges, actor and singer. Prints of Hattiesburg, Mississippi, can be purchased from Village Prints at https://www.villageprints.com/drawings/mississippi/hattiesburg-ms.